The Caribbean is a region with incomparable culture and some of the most enviable beaches in the world. It’s also no surprise that visitors — hordes of tourists to be exact — come by way of cruise ships, planes and ferries to enjoy the islands each year. Whether you’re a seasoned Caribbean loyalist looking to get a little more lost than found, or a newcomer who prefers to avoid crowds, there are definitely options for you. With just a little planning and patience for traveling to more remote locations, you will be rewarded with some of the most beautiful scenery in the world, and locals who are passionate about showing you a different side of the Caribbean. Visiting Antigua is an opportunity to avoid throngs of crowds and support its sister island Barbuda as they rebuild in the aftermath of Hurricane Irma. These islands are a testimony to resilience and the heart of Caribbean hospitality. In Antigua, there is no shortage of beaches — in fact, the island claims to have 365. Some of the most show stopping, sandy paradises include Half Moon Bay on the southeastern coast and Carlisle Bay, where low hanging palm trees and even a goat or two will set the scene. If you love seafood, you’ll have no trouble finding a grilled lobster or conch to dig into. For some of the best, don’t miss Papa Zouk. For an unforgettable sunset, Shirley Heights is the place to be. On Sunday nights, you’ll find yourself with a rum punch in hand as you listen to local soca vibes from a steelband. 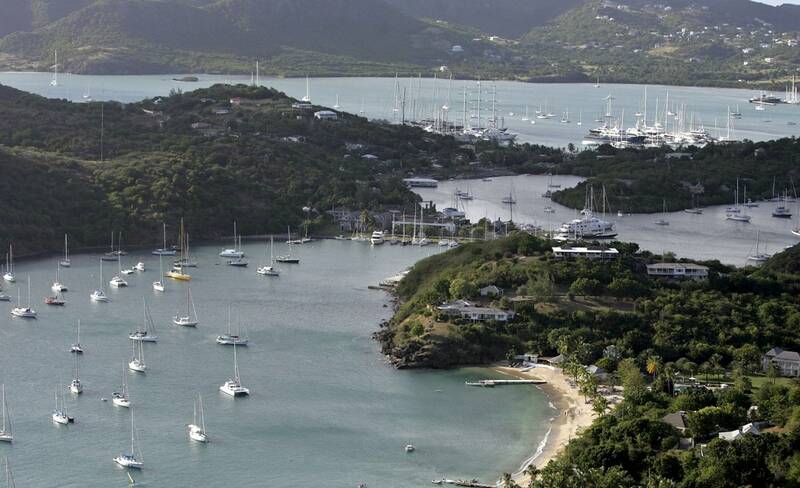 How to Get There: JFK has nonstop flights JetBlue flights to Antigua that take around 4.5 hours. Where to Stay: Hermitage Bay faces the Caribbean Sea, meaning you’ll get flawless water and views — but it’s the people who work at Hermitage that make it unforgettable. It only takes one day to know everyone by name, and you’ll find a small family of caring people to help you every step of the way. Hillside pool villas offer panoramic views of Antigua’s crystalline water and cuisine like grilled wahoo with pepper sauce should not be missed. There are free yoga and pilates classes weekly. This is the type of intimate hotel that leaves a lasting impression as soon as you pass its wooden gate. A two-hour drive from the Dominican Republic’s capital Santo Domingo leads to this countryside and beach haven. Las Terrenas has its fair share of tourist pockets, but it’s up in the mountains that you’ll find a retreat from it all. How to Get There: Fly into capital city Santo Domingo, followed by a two-hour drive. Where to Stay: Monte Placido is a mountainous haven hoisted above the more populated town of Las Terrenas. Here, six private homes are available to rent on AirBnB at a price that you simply can’t beat, from hosts who go the extra mile to make sure their guests are comfortable and knowledgeable about the area. Each accommodation at Placido has country or ocean views and share an infinity pool with sweeping views below. There is even a yoga cave tucked away in a hillside grotto available for meditation and workouts. You’ve likely heard of this island’s bigger contender, Grenada — but Carriacou is its sister island just 20 miles north with a whole vibe of its own. Known as the “land of the reefs,” the island boasts of some of the most beautiful coral reefs in the world. Although Carriacou is just 13 square miles, it some 5,000 inhabitants possess a powerful culture both far and wide. The Big Drum Dance or Nation Dance of Carriacou is a revered event where Carriacouians celebrate the African tribes they originated from through dance and song. For beach lovers, turquoise waters are endless here. Anse La Roche and Sandy Island are two serene options with unbelievable beauty. How to Get There: St. Vincent Grenadines Air (SVG Air) operates daily flights between Grenada’s Maurice Bishop International Airport and Carriacou’s Lauriston Airport. The flight takes 20 minutes. Where to Stay: Bogles Round House is a quaint bed and breakfast that offers free WiFi and a restaurant with an emphasis on local cuisine. When it comes to most people’s expectations of the Caribbean — powder white sand, megaresorts, and tourists — Dominica is definitely a rebel island setting its own tone. Here, nature takes the center stage, and it’s easy for a solo traveler to get lost in the island’s mountainous terrain or hot springs. Located between Guadeloupe and Martinique, Dominica is home to the indigenous Kalinago people, who’ve lived on the island since the 13th century. Visitors can set up a tour to visit the Kalinago villages and learn more about their rich culture. There is a World Creole Music Festival every October that celebrates the music of the region for three days. How to Get There: Although there are no direct flights to Dominica, visitors can fly to Antigua, St Lucia, Barbados, Guadeloupe or San Juan in Puerto Rico and then take a local flight to Dominica. Where to Stay: For an intimate stay with incredible views, it doesn’t get much better than Secret Bay. Just off the east coast of Puerto Rico sits this idyllic paradise with one of the best beaches in the world — Flamenco. Here, the picturesque, Caribbean blue ocean that almost looks unreal actually exists. Culebra is a no-frills island with makeshift bars, unassuming accommodations, and peaceful vibe that differs from the hustle and bustle of capital San Juan. If you love underwater adventure, Culebra is an incredible place to snorkel and dive. How to Get There: You can book a direct flight from San Juan, or take the ferry. Where to Stay: Tamarindo Estates offers one and two bedroom cottages for rental. There is an onsite pool and a beach nearby.